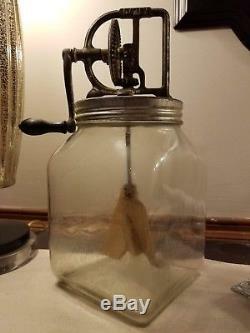 VINTAGE DAZEY BUTTER CHURN NUMBER 40 MADE IN ST. LOUIS WITH SCREW ON TOP. 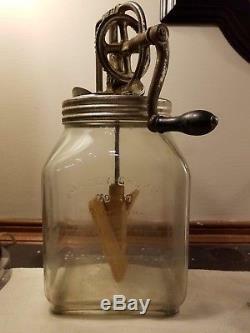 THIS IS A VINTAGE DAZEY BUTTER CHURN NUMBER 40 THAT WAS MADE IN ST. LOUIS AND IT FEATURES THE CLASSIC SQUARE DAZEY GLASS CONTAINER AND THE REVOLUTIONARY WOODEN BLADE AND CRANKING SYSTEM. EMBOSSED ON GLASS DAZEY CHURN NO 40. 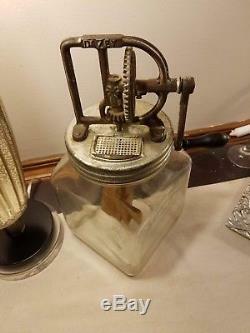 THIS DAZEY BUTTER CHURN NUMBER 40 OPERATES FULLY, AND THE CRANK AND GEARS ARE ALL OPERATING FINE IN BOTH DIRECTIONS. 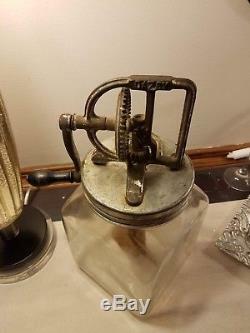 THIS DAZEY BUTTER CHURN NUMBER 40 IS A VINTAGE ITEM AND ALTHOUGH THIS ITEM WAS WELL CARED FOR IT HAS SOME CONDITION ISSUES AS COULD BE EXPECTED IN ITEMS OF THIS AGE INCLUDING SCRATCHES TO BOTH THE TOP AND GLASS CONTAINER AND THE SILVER ON CRANK AND ON THE LID HAVE WORN AWAY IN PLACES. The item "Vintage Dazey Butter Churn #40 4 Quart Embosssed COMPLETE CHURN" is in sale since Thursday, August 16, 2018. This item is in the category "Collectibles\Kitchen & Home\Kitchenware\Butter Churns". The seller is "niklazis0" and is located in Raleigh, North Carolina. This item can be shipped to United States.